A rich, young boy - only 10 years of age but very mature and responsible. 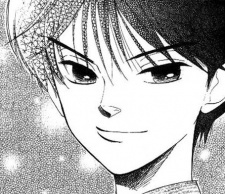 He usually teases Satoko and fears that the female lead would reject him. At times he seems to be frustrated and wishes that he would be more older. He has a childish side to him and has a younger brother whom he cares deeply for. Even though Fuuma is strict and harsh at times, he literally worries over everyone but doesn't want to show it.